While it may seem trite, it really rings true. Think of the number of times you have had to admit that, though you gladly travel half way around the world to see something and call it a vacation, when you actually play the tourist at home you are magnificently rewarded. My incentive to take the backyard adventures I detail in these pages is two-fold. The first is boredom. My life has settled into such a predictable pattern that I crave a little shake-up. There is only so much routine I can stomach before the itch to just break out and do something different becomes overwhelming. (There are only so many books I can read.) The second is a simple desire to move – To get out of the house, to get some exercise, to get my husband away from his computer games and walking in the fresh air. 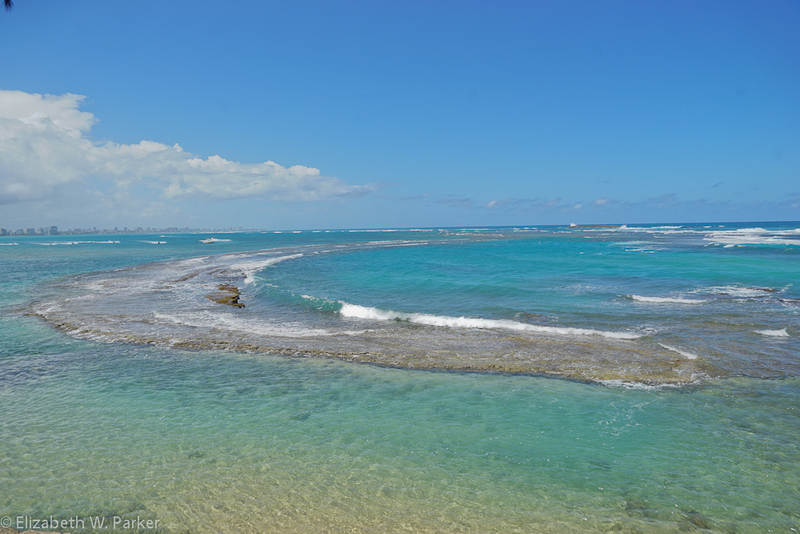 Last Sunday morning, I convinced my husband to leave the house and to venture onto the boardwalk in Piñones. As is his wont, he stated there was nothing to take pictures of. But forces of Nature can never be predicted with accuracy – and so we had an absolutely gorgeous day to take pictures of the beach and the surf. 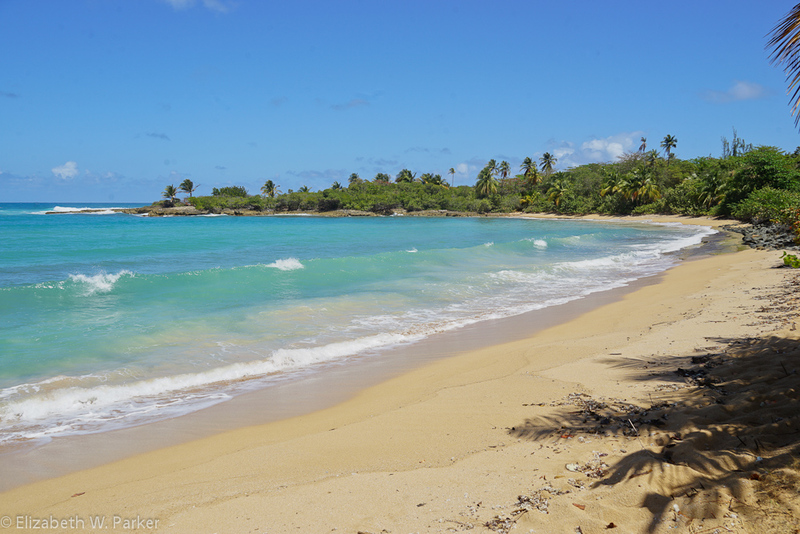 Piñones (pronounced pin-YONE-ays) is the nickname for an area of the beach just beyond the Carolina-Loíza municipal boundary into Loíza. For us, it still clings to its fame as a place with a lot of crime and a fair quotient of danger. But years of Sunday lunches at the Waterfront Restaurant, where I sat gazing longingly at the wide boardwalk stretching in both directions at my feet – families and friends strolling or biking by to enjoy the view – were ever building in me the desire to walk those planks for myself and to experience first-hand the supposedly dangerous ( and therefore exciting?) Piñones. A good view of the boardwalk. Eventually the path is asphalt. 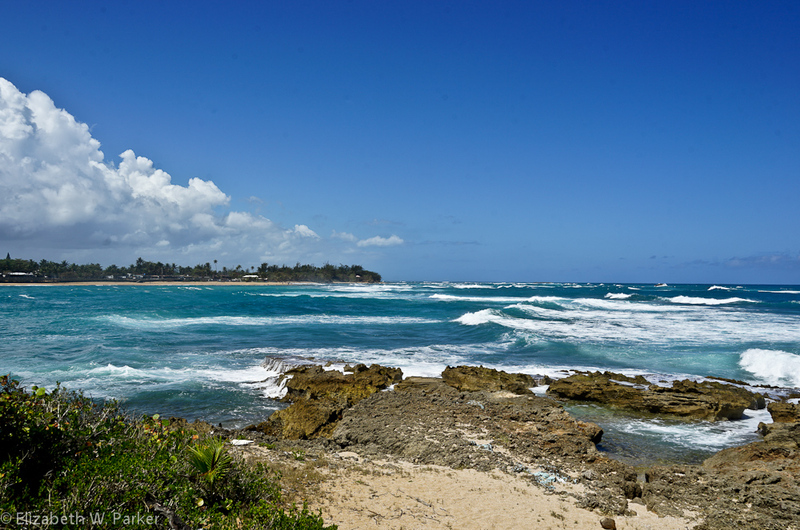 To get to Piñones from San Juan, you travel east, through Isla Verde, and turn onto #187 before you get to the airport. 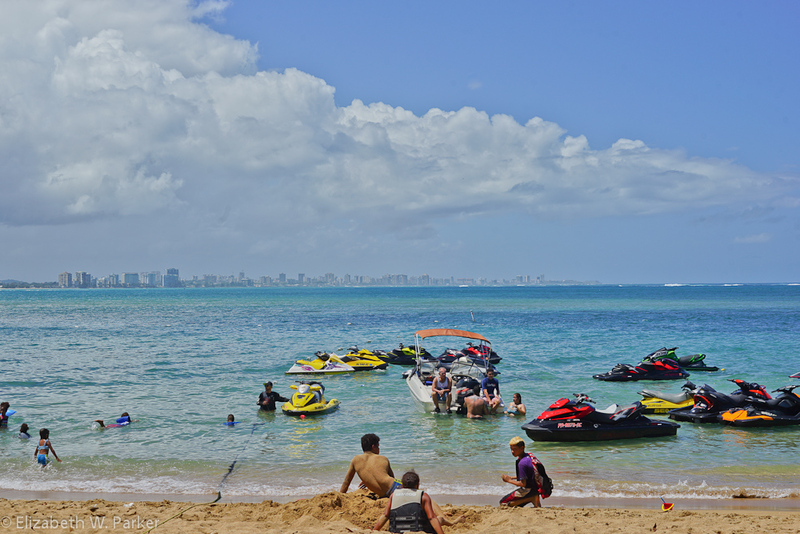 You eventually pass the last of the Isla Verde condominiums, then the balneario and finally travel over a bridge that takes you into a new world. Piñones, like all of Puerto Rico, is not going through the best of times. On our Sunday morning we found as many restaurants shuttered as we found open – and it wasn’t just the time of day. Never a consistently hopping place, Piñones is pretty organic, in the sense that corporate interests haven’t discovered it yet so it ebbs and flows with the general prosperity of the island. One thing in you’re sure to find? Local people! Not so many tourists, though there are some. But locals there are in abundance. And where there are locals there is a sense of “fiesta” even in something as mundane as a Sunday at the beach! But before we partook of the fiesta and food, we partook of the boardwalk. 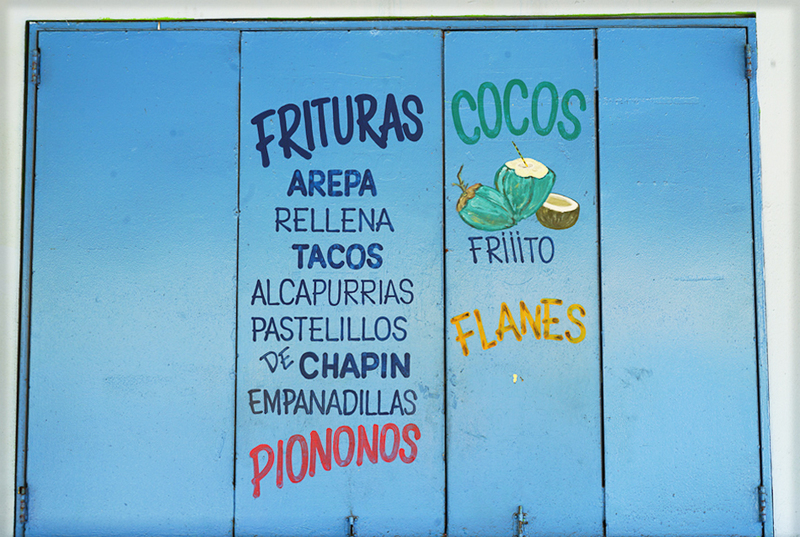 I discovered that you can probably eke out a 4 mile walk in Piñones – from the restaurants near the bridge to the kiosks at the other end, the boardwalk and its asphalt extension stretches through mangroves and vaulting sea grapes, past waves breaking on sandy coves and smashing against craggy reefs. The spray will fill the air (and your lens) giving a hazy, dreamy feeling to what you see with your eyes and what your camera records. The visual rewards are many! Looking back at San Juan, you can see Isla Verde, Ocean Park and Condado strung out like beads along the coast – at the end in the haze – there is el Morro! Looking the other direction, once you are well into the walk, el Yunque rises in the background, just barely distinguishable on our day from the clouds and haze create by the salt spray. Rocks, waves and sun – here we are looking westward. But today, the ocean is really the main actor. I thought about how to describe it to you – and any verb or adjective of force or violence would catch the action, but not the personality of the ocean today. Imagine: The sky is a brilliant blue, clouds lingering far off on the horizon at the horizon. The sun is magnificent, and there is a splendid breeze. The waves are vivacious! Their energy is infectious. Rather than awe at their power, they inspire thoughts of beauty and munificence. I discovered that the terrain out here is not just beach. There are reefs shaped and carved by the action of those capricious waves and rocks that stand as bulwarks to protect the shore. There are palms to be sure, but also dense jungle of sea grapes and scrub trees, bowering the path with welcome shade and cool. Have you ever seen a reef like this? Do I recommend it? Absolutely! We ran into families on rented bikes as well as other walkers; we enjoyed the conversation with other diners at the New Reef Café. We also talked to a police officer about the area’s infamous crime. No more, he told us. Now the police have patrol cars in the area regularly and crime is no longer a problem! We also encountered tourist hotels along the route and saw a tour bus stop at one of the bars along the beach beyond Punto Maldonado. So yes, go! Be sure to time your visit with food – be it the fried snacks or a real meal. The perfect Sunday, don’t you agree? PS Here’s a link to that little guest house in the slideshow photo.